Once again, Vikram got Betal down from the tree. As he was carrying him, Betal narrated another story. King Chandradeva was a just king. One day, a neighbouring king threatened to attack him. Chandradeva did not want a war because it would lead to the death of many of his soldiers. 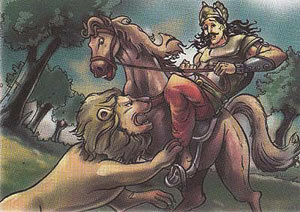 Chandradeva asked the neighbouring king to fight with him. Whoever won, could take over the other's kingdom. The neighbouring king agreed. Chandradeva won but he did not take over the neighbouring kingdom and spared the king's life . After a few days. Chandradeva went to a forest, where a lion attacked him. A thief who was hiding in the forest saved his life. The thief hoped that Chandradeva would reward him. Instead Chandradeva had him hanged. Betal asked Vikram , "Chandradeva spared the neighbouring king who was his enemy and hanged the thief who saved his life. Was the king's judgement right?" Vikram replied , "Chandradeva was right in judgement. A king's first duty is to think about the welfare of his kingdom. By forgiving the neighbouring king, he made sure that there would be no thefts in his kingdom." Betal said , "You are right." But you broke your silence and here I go." Betal flew back back to his tree.